With doctors sharing their opinions on various specialities of medicine and picking their favourites amongst all, we wondered if a doctor’s gender plays a role here. 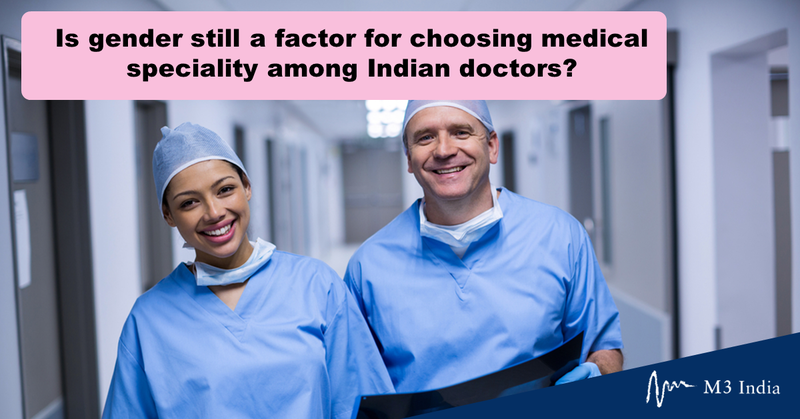 The recent M3 India survey examined the trends among doctors while choosing a speciality and the likely factors affecting this choice. A total of 471 doctors responded to this online survey. The respondents were divided into four categories viz Medicine Generalists*, Medicine Specialists, Surgeon** and Others category***. Choosing a career in medicine -does gender play a role? While personal interest is an important factor, does a medical graduate’s gender influence one’s career aspirations, are they better able to access participation in certain fields of medicine than others? These were some of the questions this survey attempted to seek answers for. The results show a clear divide across all the 4 categories of the respondents. Half of the respondents agree to the fact that gender does play a role when a medical graduate chooses a speciality while another half of the respondents refute this theory. Respondents commonly mention that women opt for “less demanding” branches of medicine. Emergency medicine, critical care medicine, general surgery, orthopaedics are some medical specialties that would not be preferred among women according to respondents who believe Gender is a key factor. Home care, family duties, parenting responsibilities are commonly cited as reasons, by respondents, for this behavior. Respondents highlight the fact that deep-rooted cultural beliefs and preferences are in play when male doctors avoid choosing a branch such as ob-gyn. Interestingly a young doctor of physiology (30-39y) says that fear of “medico-legal” issues is another reason for this behavior. A young (30-39 y) ophthalmologist among the respondents puts it in these words, “Female doctors prefer balanced lifestyle and choose specialities in which there is less demand from work hours and stress. Female doctors who can sustain overwork and are passionate prefer Obstetrics, Gynecology and few surgical specialities. The survey results point to a shift of behavior in this regard. 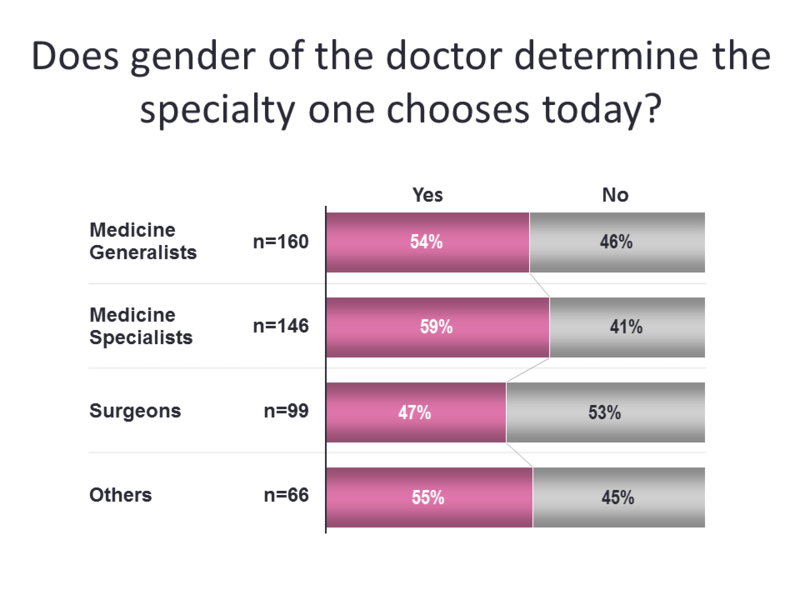 Among those who disagree that gender influences the choice of speciality for doctors, assert that there is indeed a shift in perceptions from the older days, emphasizing that “personal interest” and “capacity and caliber” are paramount. Respondents point out to the fact that we are in the “21st century” and “there is no place for gender in medical field now”, “the gender differentiation is now dissolving”. We have respondents who have mentioned that a patient’s attitude towards doctors are also changing and now we can see more male gynecologists than earlier. Similarly, male-dominated specialties such as surgery are also being picked up by women now. A young doctor(20-29y) says, “It doesn’t matter which gender you belong, the dedication toward your work matters”. A young doctor (20-29y) says, “In today's scenario, both male and female doctors are choosing their postgraduation according to their own interest, Right now older scenario is changed for example right now more female doctors are preparing surgical branch, and male doctors are also preferring ophthalmology, Obstetrics, Gynecology, and other branches...”. With this third part, we close this survey report on a positive note that earlier trend of restricting a speciality is changing and gender will soon cease to exist as the deciding factor when a medical graduate chooses a speciality to pursue as a career. What is the most coveted speciality among Indian doctors today? We have presented the data and facts as they are without generalising the results as a reflection of the views of entire Indian doctor population. The demographic profile of the survey participants [shown above] may differ from the population of all Indian Doctors. Also, limiting the sample to the Internet channel only may introduce bias in the results. We also urge that the findings should not be interpreted as implying cause and effect.